With the circular no. 53 of 12 April 1860 were introduced the new standard-postmarks in whole Russia. These postmarks are -as we see on the card here- one-ring postmarks with the date on three lines: day in arabic numerals, month in cyrillic abbrevation, year in four arabic numerals. 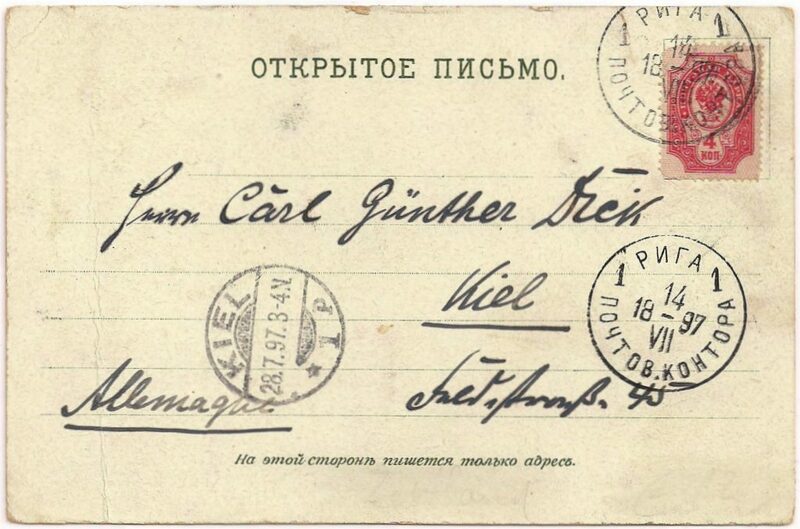 In the top of the postmark: РИГА (RIGA) and under in the postmark the Main post office had a ornament. In the book of V. Marcilger is given a description of many sub-types. On this card the postmark is not so clear. The month ‘АВГ’ is short for АВГУСТ (AWGUST), August. The postmark of this cover has clearly an ornament at the bottom: the main postoffice. The main post-office, corner Suworowstreet and Theatre-boulevard. On the other side: KRAG-machine-postmark. The card has on this side a double-ring postmark and is sent 24 January, 1914, to France. The main postoffice was situated in the old city: in the König- and Herrenstrasse, near the Kalkstrasse. 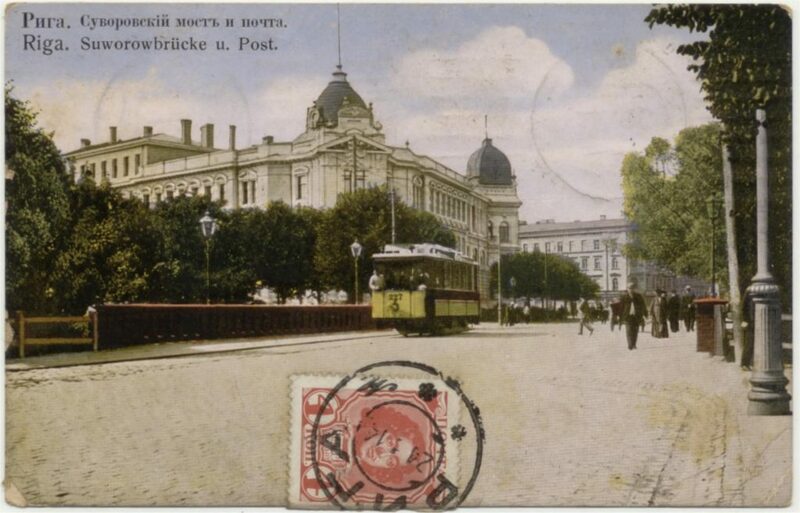 In 1905 the main post-office moved to a new building on the Theater-boulevard. In Russia the delivering of post in the cities was done by separate ‘city-post’, not incorporated by the Imperial (state)post. With the post-reorganisation of 1885 the city-post offices and telegraph-offices were united with the Imperial (State)post. In Riga there was from 1875 city-post-offices, but it not clear under who was responsible for them before 1885. Riga 3: the third city postoffice was situated on Moscowstreet 54, house 4. The standard-stempel type I, described above, is used by the main post-office and the first city-postoffice. The Type II , described here below, the cross-date postmark, is used by the main postoffice and the first, second and third city-postoffice (sub-postoffices). The double-ring-postmarks, type III, is used by the main-postoffice and city-postoffices (sub-postoffices) 1-9 . In the handbook of von Hofmann are mentioned 22 different postmarks of the first type with РИГА (RIGA) in the top and the ornament below. The measure of РИГА can be different, РИГА. with or without point, the ornament can be different. 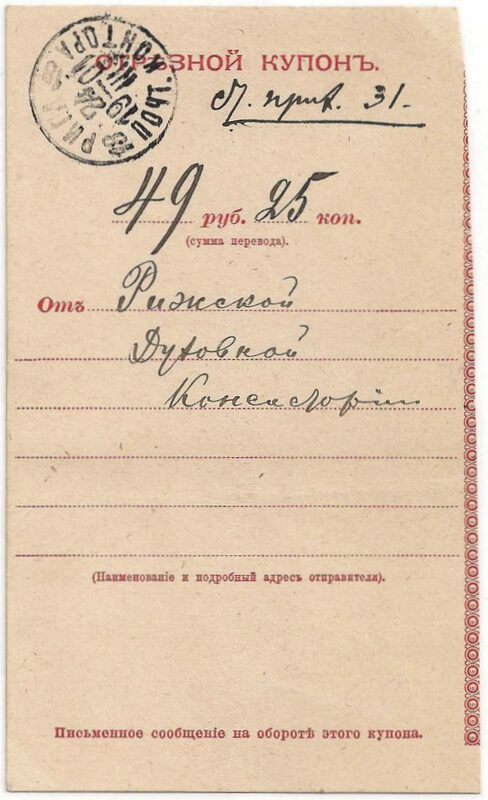 There are more postmarks of the first type (date in three lines, single-ring): also 5 postmarks -different serialnumbers- are mentioned with below the indication ГУБ. ПОЧТ. КОНТ. In circular 13 of 5 April 1890 the instruction arrived to use Roman numerals for new stamps. This happened on suggestion of the U.P.U., the Universal Postal Union. 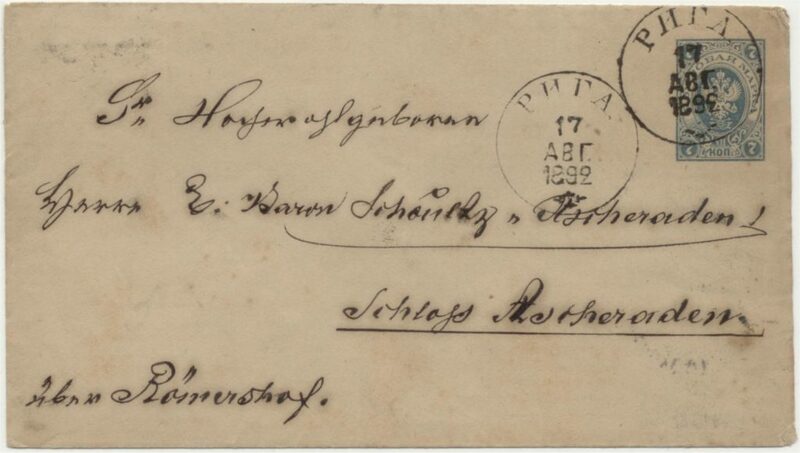 Also the postmarks in Russia change in the ‘crossed date’-type. In the middle the day stays first, under it the month (in Roman numerals), left of the whole the century and right the rest of the year. 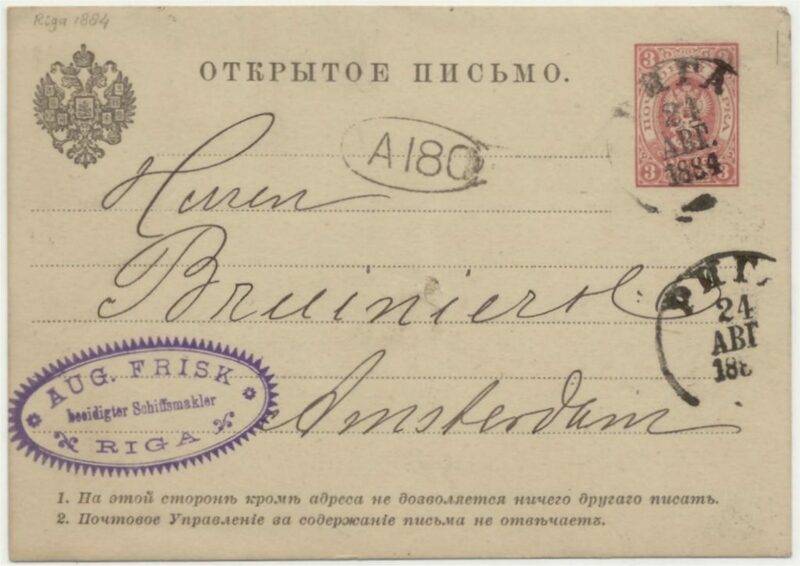 Card, sent to Germany on 14 July, 1897.This card has a clear cross-date postmark, serial number 1, with below the indication ПОЧТОВ. (POCHTOV.) КОНТОРА (KONTORA). This postmark has as (reported) dates of use: 26.08.89 – 03.01.08. The main post-office has used two series postmarks of this type. The first series has the text POCHTOV. KONTORA -as the postmark above here ПОЧТОВ (POCHTOV.) КОНТОРА (KONTORA). Possible serial numbers are 1, 2, 3. The second series with text on the bottom: ПОЧТ. (POCHT.) КОНТОРА (KONTORA). This series has serial numbers 13 – 20. 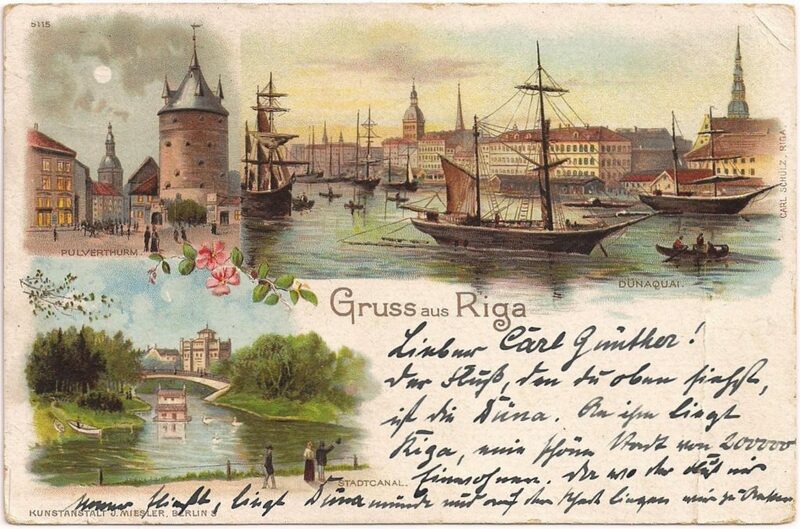 The picture side of the card above is also very nice: Greeting from Riga. This is a part of a money-tranfer formular. This part was for the receiver. The right part, the master card, get the postmark ОПЛАЧЕНЪ [OPLACHEN], paid, and was sent back to the sender-postoffice. 20 11 90 – 11 04 03.